I had a big plan for 2017. I wanted to go big. I wanted to go fast! I didn’t want an injury! Guess What?! I got injured before Christmas! So 2017 started with the need to lose the belly, keep swimming and get past my lower leg faults. Oh what a year it was…. I need events to keep my motivation, but I am a bit mental so I saw the Cheltenham Lido Brass Monkey Swim advertised. This is 500m or 1km swim in the lido. “It is recommended that only seasoned experienced winter swimmers who are acclimatised to swimming in very cold water take part. The event will be cancelled if the pool is iced over and entry fees refunded.” 1km then please! It was 4.7C. I couldn’t decide between boots/gloves/nothing along with the wetsuit…..boots stayed on but they really affected my swim as they were too buoyant. Tumble turns were flushing the cold water into my suit so I swapped to pushing off normally. It was tough. I won’t quote the words I used but I think it was a bit too cold! Still, I managed to finish and I came second too! The winner is a bigger nutter than me, having done the channel twice and also several 40+km swims. This year he swam 10km each day, for 30 days! March next and a trip to Scotland for the Red Bull Neptune Steps. Another cold swim (9C) but with a difference….there are climbing obstacles! Held in Maryhill Locks in Glasgow, there is about 400m of swimming but you do 13m of climbing at the same time, over all the canal locks! Last year I did really well and got into the final. This year was very busy and it was hard to get a decent position on the start line. If only I had though. My heat I did really well, 11th fastest overall. Then the semi is where it went wrong! I got stuck at the back and had to wait at the first obstacle…I went on to overtake 6 people as the race progressed but this put me in 11th in the Semi and only the first 10 get to go to the final! Gutted, but really enjoy the event. If only it was more than once a year and a bit closer to travel to! The next day was the GoTri Duathlon. I wasn’t quite ready for this. I hadn’t really been running at all, let alone done any brick training yet! I had no idea what pace to run at. I didn’t realise how weird riding a bike after the run was and I wasn’t expecting to be part of a cartoon. It was good fun to play wacky races with Russell…even if he did go on to beat me! 3rd overall is a great result for my first duathlon! 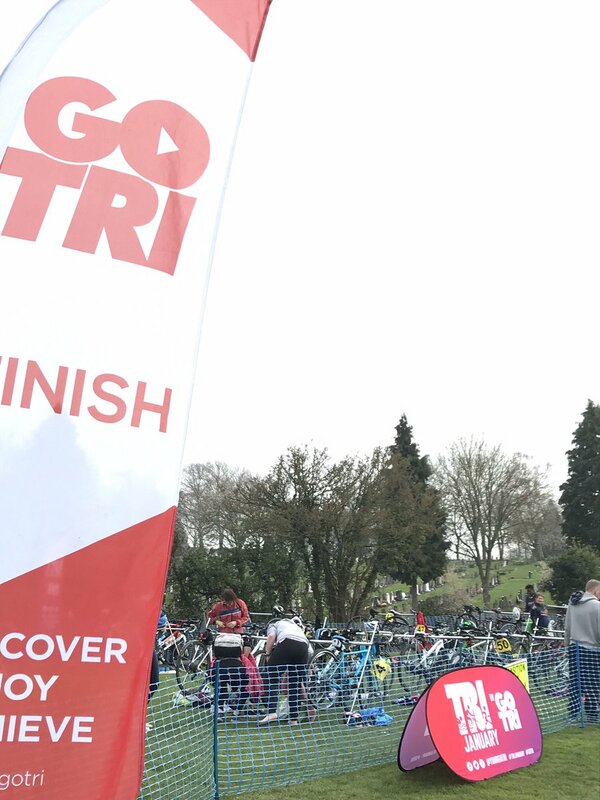 I wasn’t planning on anything tough this year so I decided that I must enter the Go Tri Triathlon, I suppose it was part of the Club Championships! I had spent the day before trying out some new wheels….which I had to completely rebuild! Let’s see if they are faster! A lack of marshals meant that I would be going off first so I could marshal the bike course. Number 1! I would have liked that as the result too! Power ranger suit was on and I was ready for the start. First off, first on the bike, first back for the run….yeah no one has caught me! Well something caught me. OMG CRAMP!!! ARGHHH. Quick stretch and attempt to run through it….pace increasing…oh there’s the finish…already?! I wasn’t even up to speed yet! Oh well. I’m then straight back on the bike to be the tail cyclist. I was feeling good again (why do I keep trying to run when cycling is so much better?!) 3rd overall?! YAY! Someone told me it was better to run off the bike when you have ridden in a triathlon position. So I did it. I got a blue bike. Everything must be blue. Let’s try it out! The Phoenix Sprint Triathlon is really local to me. So local I thought I didn’t need to get there early. What a fail. No time to warm up. No time to focus on the race. Idiot! The swim I should be really confident on….until my throat started killing me….ARGH! Should I be able to taste blood? This is why you should warm up. This shouldn’t matter, I’m still 2nd out the water and I get to ride the new bike! Yeah! Right, let’s get some drink on board as you’ll need that for the run! *PUKES*. Hang on a minute…what’s going on? Drink….Puke. Eugh! This is why you should train how you race! I worked out that the aggressive position squeezes my stomach so I can’t take anything in! I hoped that I would be hydrated for the run as it could be a tough one. On the run I felt pretty good actually. Did a negative split! How did the bit I dread become the best part of the race?! My run was a full 2 minutes faster than last year! I am so happy to see that because I was at my running peak in May 2016 and I’m now feeling better! Is the injury nearly gone?! No time to think about that…Another race – RLSS Open Water Mile the same day! I missed the warm up. Straight in ready to race! I was off……only thing is I was feeling pretty tired so decided to pace it and stick in behind the leader. The first lap is coming to an end and then a guy comes past me. Then he disappears. Then he is front of me again. Then he disappears. I guess this guy can’t swim straight…now I cant swim straight because I am laughing too much. Then he peels off way off to the side down the big straight. “Where is he going?!! !” Then there’s the finish. We finish kind of together. I jump out and say, “You’re quick but you weren’t swimming straight!” I think he thought a mile wasn’t far enough! While I’m feeling more confident with my running, the Run for Beer Relay is here. I find the added pressure of teammates helps me push through as I don’t want to let them down! With a slight team change, we had to defend our title of “Fastest Non-Running Sports Club”. It was me off first, so I had plenty of time to check the laptops while everyone else was running. I was off quick, too quick….eugh that was painful! Not as quick as last year but nothing to be sniffed at! Just got to wait for everyone else to do their thing and see where we are! WOW GUYS! WE DID IT!  “Fastest Non-Running Sports Club 2016 & 2017” YEAHHH. Just two days after that I had a nice 64 mile bike ride for the CFC Sportive. It was meant to be my first century and had entered the 150 mile ride, however tickets to IRON MAIDEN in London made me get up early! I set off with the big boys at 7am and stayed with the pack, going at a much faster pace than I would with 150 miles ahead. I didn’t expect to be at the front, towing such a large group towards Saintbury hill, where the group would inevitably split up! A few more miles to the first feed stop and then I split off the group and it was really lonely….all the way to the last feed stop! I was first over the line…..but I was doing less than everyone else! Definitely one to go big on for next year! The next event was just a swim as part of the Cotswold 113. This is an event that I knew I would feel great doing. A nice 1.9km swim where I had no need to bike or run afterwards. As I was part of a strong team, with David and Oscar from Do3 Squad, I was looking hopeful for it. Of course I was first out the water, but it was really tough! I have definitely lost some of my swim speed, since I have not been training that much! Just a little bit quicker than I did last year. Had there not been a hiccup with Dave’s bike and Oscar having not been injured in the weeks running up to it, we would have won, but 2nd place is not to be sniffed at! Well done Team! The Cotswold 113 is one event where I want to conquer again. In 2016 when I did the full event, with a pretty rubbish run, I was surprised to be told that I had been fast enough to qualify for GB! So I could have and should have gone to Denmark (even with my injury) and raced with the girls after all!?!! Cotswolds 2018 you better be ready! WTS Leeds. Ooh look, an event where I could compare myself to the Pro’s?! Had it not been for entirely different courses for mortals and professionals, this would have been a great idea! Not letting that bother me, I was looking forward to a large scale event where there would be lots of really good Triathletes in attendance! Hang on, you’re saying I need to leave the blue bike, in a park, in Leeds, overnight?! With a sleepless night, I was up and ready for the race. Blue suit on. Let’s get to the park. Hang on a minute, all the roads are closed. I need to get there. After 15 mins of racing round the cul-de-sacs, I finally found somewhere to park and ran across to the race. I just about made it on time (I thought I would have learnt not to do this by now!) A quick change and fully setup transition, I walked to the lake. Yay, actually enough time to get warmed up ready for the race, but not enough to queue for the portaloo’s….I’ll be doing that in the water then! A nice single lap 1500m swim. I was there, at the first buoy, flying along in the water. Hang on they have changed the course from how the bouys were yesterday….argh. After a change of direction, the chasing pack caught me up. I’m not towing youu…let me rest and you can tow me! Phew, I’m 2nd out the water…everyone is running really fast to transition. It was quite a distance to run to the bike but I was looking forward to flying round the course on the blue machine. Flying was right. I even lost a bottle on a rough part of the course. Only the most expensive bikes were coming past me. I was feeling good! That second lap was tough, I hope I have enough left for the run! The run started with a steep hill up out the park…I probably went too hard there. Better settle down now im on quiet roads. I spot a GBR tri suit or 3 going straight past me. It was a case of running in one direction all the way to town, then two laps and then ill be done. I dropped a gel and knew I needed it so I stop and grab it! Okay. Just one lap left, push it! Push it I did – what a well paced run! I even caught a GBR guy at the finish too! Yeahh! Now the important part, Erdinger! 91st Overall and 15th in my category! And really really close on the all important percentage to be an age grouper! Not bad! Running improvements are my priority as the injury seems to have passed! June Wales National Velodrome – THIS IS SO MUCH FUN, YEAHHH, do it! Don’t even worry. Just go for a coached session. I really want to go back! Darren, when is the next one? RRPCC 25 Mile time trial. Having really enjoyed riding the blue bike, I had to make the most of it. A time trial  A long one. 25 miles is a lot longer when you’re going at max effort. I had also been playing with the riding position so I was more aerodynamic. I wasn’t used to it and the last few miles were really painful in my hamstrings. I even came 3rd! Yeah I love this! Got to do more of these! Running isn’t my strength. It never has been. But I am a bit mental, so when someone said at the start of the year, “do you want to be part of a 24 hour running relay?” and I am still injured, I am like yeah, I’m sure I could do a couple of 9km laps. As this event got closer, I was actually looking forward to it. Theres 8 of us, so theres like 6 hours of recovery in between, I’ll just fly! Then as it actually got closer, people were dropping out. Then there was 6 of us, until the day before where the 6th was properly ill. So, having had a car accident less than 2 weeks prior, this was it. I could be running further than I have ever done! Cotswold 24 Hour Relay was GO! The event started without me, because I had to pick up my new car and then drive it immediately 90 miles to the event. I was 3rd to go, having never met Emily, our 2nd runner. I had approximately 45 seconds to work out what she looked like, before she went to take the baton from Lucy. This was it. I cannot let the team down. The last run, was a track intervals session, so that was what my legs were used to. Not a mixed surface, hilly 9km relay where you have to run several times. The baton was passed to me and I was off….like a rocket! “TOO FAST” a woman shouted at me. I was thinking, I know, but how do I run slowly?! The first km, at faster than my 5km race pace…the second not far off..the pace barely slowed by the 4th km but then it had picked up again. The hill was the perfect gradient to use my strong quads, it didn’t even affect my pace! Strava then tells me I am 36th fastest overall. Noone overtook me. Can I do more laps like that? My next lap was only slightly slower, the third about the same as that one, but in the dark! So far, my speed meant that no one had overtaken me. I was flying and I was running really far! My next run was to start about 2am. Two of our team were hurting so went to bed. I had the feeling that I was going to do a double…I had already ran 27km (way further than I normally do a week! )..I got my gels ready. The first lap was good, it was a good temperature, I was going slower, I was feeling comfortable, still going faster than 8 min mile pace, which is my usual long run pace! A guy went past me, I read his top….i said you’re the first to go past me on the hill, he said overtake me back, I said no I have two laps to do! I took my gel on, to keep me going for the middle 6km At the end of that lap, people were waiting for me, but the next runner wasn’t there. So I flew through and went for it. I had to continue….the gel went it at 3km….6km to go……1km later I am struggling, not with my legs but my bowels….i jump in a bush….no I cant go here, just finish, its not far now…..i run further, only 4km left…..argh, no, get in that bush! I grab leaves from the tree. I do it. I get running again. Just get back and you can shower! I finish, Martyn takes over, pressing play on his podcast….Stuart, you have ran 45km! Bedtime. I manage a few hours before my bowels wake me up. I feel so rough. Just one more lap Stuart. Oh look, Andy is awake. OMG Emily, you did a double in the night too! This last lap is very tough, I cant push it too hard as there isn’t much left! Still, it’s a quick one and our placing is looking good! Just 3 runners left and that’s the 24 hours of running done! We all cross the line together as Andy comes into the finish! We did it! In the “teams of 3-5 mixed” category, we came 6th of 44! And 34th OVERALL! WOW. BIG EFFORT AND WE ARE REWARDED WITH OUR PLACE! OOPS I GOT DQ ON THE SWIM! But then I DNF At the club championship race hosted by BRAT. So I didn’t really expect this to happen. I went to this event halfway through marathon training so I felt really confident with my running (for once). This was an event that I was expecting an average swim and fun on the bike before impressing myself on the run. I had got there on time and and felt ready. Had a land warmup after a jog. Everything looked good…..As usual I pulled out ahead on the swim with a guy on my tail. He and I worked well together and pulled out a big lead on the rest of the field. We both didn’t really know where the course went and got out the water pretty quick. As soon as I wasn in transition the referee both told us that we were DQ for missing the last bouy. I thought meh, I have come here to race something for fun and decided that I would continue and make it a training session. The guy I swam with was flying on the bike. It felt like I couldn’t get warmed up. I then found my speed building towards the later parts of the bike. Felt excited about the run too! Through transition and out on the run – absolutely flying until……my niggle! It was agony. The front of my calf made it unbearable to run so I stopped. It’s the left leg. The one with the timing chip. I loosened the chip. So I must sort the chip BEFORE I start running or even before the bike. I think my leg swells on the bike and this results in a pain. As it was agony and I was DQ I decided to abandon the race. It wasn’t worth running on the pain as it could get worse. I walked to transition to tell the referee that I was DNF. I was then told that I wasn’t DQ but had a time penalty!!! This race was officially a write off. I have learnt a lot and will not do the same mistakes again. The next day I managed to run close to 10k PB pace….clearly there wasn’t an issue with my leg and it must be the timing chip! I think I really enjoy the pain of Time Trials and the TriRedditch 10 Mile TT I had a great little ride out. Thank you for the photos I have got showing that I have quite an aerodynamic fit and I am finally comfy on the TT bike! I did alright too which I was pleased about! I registered and entered the Velo Birmingham a couple of weeks before, knowing that friends would be there and it would be very close to the marathon. Definitely a great day out with friends! Maybe the best was playing I spy with my little eye, something beginning with T………..yes this ride was epic! Niggles during a long run in the middle of August….cut short. I don’t do the longest runs. 17 miles was the most. I go to Canada with the idea of doing a long run while there. I feel terrible and don’t have the motivation to train. Taper week 1 – I get ill. Its over. Saturday before – I have a gym session to get myself loose and ready to move again. Monday before – I run in new trail shoes. I get a massive blister. Now I cant run. I think it wont happen so I enter another one to keep the running training motivation. Tuesday evening I have a low which ends up as a mental breakdown and decide I don’t want to do anything anymore. Thursday – I did a track session with friends and probably pushed myself a bit too hard as I am quite sore the next couple of days. Saturday – I couldn’t get up in the morning. I am then told that the car parking isn’t going to be close by. Saturday night – they start working on the rail track outside my window. I get a terrible nights sleep. I don’t get much of a warmup (700m) but I feel ready-ish. 5 mins to start…. So yeah I start running….too fast a pace and I have dropped the 3:30 pacer…so I back off to just under 8 min/miles. That should work I’m going alright. The crowds are there. There are others all in the same boat. I can do this. Within 10km my hip flexors are hurting (must work on those). I need a wee – but where. I look at bushes but then see the portaloos – are they free. I swing open the door and wee and then straight out to run. I run faster than I should. I then catch back up with the group I was with. Back on pace again. I can do this. I decide to change from 4 miles gels to 6km gels – I can always check my watch to find out how long and I don’t have to remember anything. This seems to work as I get back on my mojo. Water every stop, Lucozade every other. I sip and keep feeding as it keeps me on track. 13.1! halfway. I shout YEAH! Just the same again to do. I wind round the little loop at the bottom I see 15 miles. The 4:00 pacer goes past going the other direction – they are only a couple of miles behind? That’s 16 mins? Surely I am going faster than that?! Maybe we are on 16 and not 15 miles?! I get confused, but check my watch: 4:49/km…that’s under 8 and the target…keep on this! More and more miles, more and more steps, more and more gels…..18 miles. I’ve not ran this far before. I feel myself starting to flag so I keep hold of the Lucozade and keep sipping and make sure I finish the bottle. 20 miles….now the race starts. Yes it is now all my mind. Do not stop moving. Do not stop. 21 and 22 pass by as a long gentle hill. The metric marathon race is now on the other side of the road. They haven’t ran as far but their faces don’t look fresh. I continue on…I feel like I am going past people. Nearing the top of this hill I feel the pace going over 8 for the first time. I look at my watch 5:15/km….that is fine. Keep pushing. Oh crap no more Sis gels…..do I take the high5? I decide to do it! I cant stop now! 23. Theres not much left to – ONE PARKRUN. I see a sign which confirms this. I then have a nice man run next to me saying I was helping him by pacing him. Me pace someone? No way, my pacing is terrible?! (read on). We have a nice chat and exchange targets and our running past. We both agree that we are going well. We both run past a Scottish man telling us that it’s all downhill from here. 24 miles. I know there’s a hill. Yes I have found it. Its up. Its steep….but it’s not that long….ouch its still painful! I turn left and it flattens off. It can’t be much longer. The pace takes a while to get back under 5 again. I see it. I close my eyes for the pain and just keep concentrating on my technique. It starts to rain. I hear an ambulance behind me so start running on the pavement. I close my eyes again. I open them and nearly trip over someone sat on the floor. I push on. 25 miles! Another left turn and it goes down….wee speed….nooo its painful. Just fly….i am now following the river. There are cobbles. A pretty bridge. There are people either side cheering and shouting. I hear my name in several accents……800m to go. 600m. I see the racecourse. I hear a man shouting the finish is on the grass at the red flag. I can see it! I can see it! OUGHHH! That grass is so horrible to run on. I start to try and pick up the pace. I don’t look at my watch I just keep looking towards the finish. I can see it. I am there! I FINISH! I stop running but my legs wouldn’t stop so I stumble and a marshal steadies me. I’ve done it! I have finished! This challenge was set to me earlier this year. After nearly 2 years since I started running. Many months of not due to injuries. After remembering my first running race in November 2015: 10k MoRun (48:51 4:53/km which was a couple of weeks after my first ParkRun. I have completed a marathon. I can officially call myself a runner. I have the dead legs (reminds me of heavy leg days at the gym) black toenails (my first one) and blisters (not the first nor last!). I have proven everything that went wrong for this that I cannot be stopped. I am probably insane.